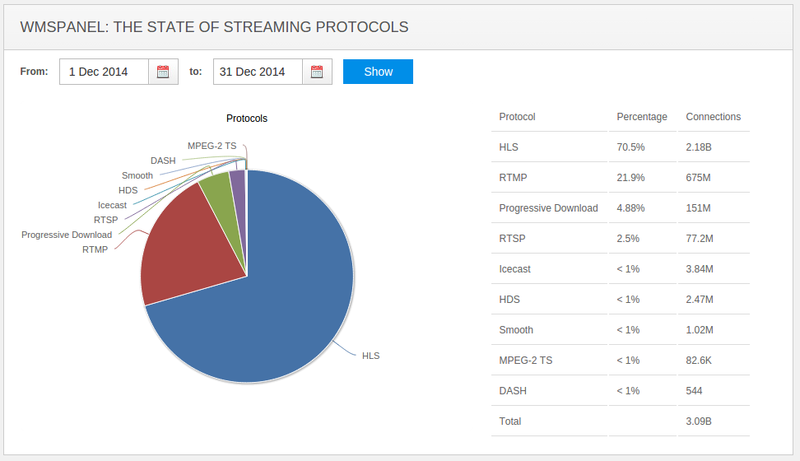 WMSPanel team continues analyzing the state of streaming protocols. January showed a lot of views which means more of interesting content to look at. This month we've added Icecast audio and MPEG-TS among other protocols. Nimble Streamer customers use them more and more extensively, especially with the latest Icecast meta tags support, so we'd like to start tracking their dynamics as well. We still see huge HLS share (about 69%). The shares of RTMP (22%), RTSP (3%) and progressive download (~5%) are the same this month. Icecast number has doubled from nearly 4M to 8M views. All these metrics calculations are based on 3 billion views. You can compare that with December stats below. These stats are collected from more than 1400 media servers, including Wowza Streaming Engine (mostly 3.x and 4.x flavors), Nimble Streamer, Red5, nginx-rtmp-module and Flussonic. We'll keep analyzing protocols to see the dynamics. This report is brought to you by WMSPanel team.